As a long time Godflesh fan since the Streetcleaner days, I for one was in a state of flux with a mix of excitement and curiosity as to what a new Godflesh release would mean and sound like in 2014. Most Godflesh fans will tell you that after 1994’s Selfless, the band’s output was consistently inconsistent at best. It ended with a more solid effort in 2001’s Hymns but still, nothing post 1994 up until that point came close from not only a consistency point of view but also a song writing point of view when compared to the band’s first four platters of industrial metal. I too subscribe to this view. When the band’s EP Decline and Fall was released in June of this year, right from the get-go, it felt right. It felt like the natural progression from both 1989’s classic Streetcleaner and 1992’s Pure. Whilst 1994’s Selfless is a bloody top album in its own right, there was something about the band’s Decline and Fall EP that managed to push Selfless just that bit further along in the band’s musical progression. And so was set a new benchmark as to what to expect from Godflesh mastermind Justin Broadrick and his long standing partner in crime G. C. Green. The bar was set high indeed. Taking into account the band’s already legendary historical output, and suddenly this new release - the band’s first in 13 years - was throwing the cat amongst the pigeons. It was doing so in a good way. The positive press it was receiving was not only bringing the band back to the attention of the metal masses, it was also showing that the duo can deliver excellent material even after periods of inconsistency followed by a lengthy hiatus. Decline and Fall certainly gave everyone a taste of where Broadrick and Green were at with Godflesh in 2014. As I noted in my review, it was heavily rooted in the band’s earlier years, which many, including this humble reviewer, will hail as the band’s best as well. A World Lit Only by Fire is of the same heritage. In fact, it’s quite possibly slanted more towards the thick, dense guitars, gruff vocals and solid, heavy beats that define what many hail as the band’s finest hour - Streetcleaner. The band’s return to form truly is signature Godflesh material and will without doubt sit well with fans. 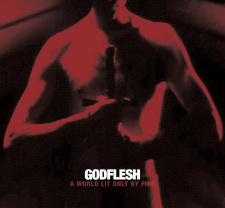 A World Lit Only by Fire is a heavy, mostly intense, dirge that brutalises the listener as only Godflesh can. It’s a premise that begins with the opening cut, “New Dark Ages”, which would easily sit alongside the likes of “Like Rats” or “Pulp” from Streetcleaner. As the album unfolds, it’s becomes clear that this album simply takes the template that Decline and Fall laid down and reapplies it here as each track delivers complete and utter aural devastation in true Godflesh manner. From the immersive opener to the dark simplicity of “Shut Me Down” through to the slower “Carrion” and the less confined finale “Forgive Our Fathers”, A World Lit Only by Fire is the album that every die hard Godflesh fan has been waiting for. This year has already proven to be a bumper crop for metal releases, but with band reunions as common as dirt these days, I honestly don’t think anyone saw a release of this calibre coming. Sure there has been a lot of hype and excitement surrounding the first new Godflesh material in 13 years and rightly so when you look at the impact the band had back in the day. For Godflesh though, it seems that they have put all the hoo-hah aside and just got straight down to business as usual. The EP was a damn fine entree but without doubt, the main course is what everyone has been salivating over. Rest assured you will be more than satisfied with the outcome. A World Lit Only by Fire is a pure and refined mix that is mostly reminiscent of Streetcleaner era material with splashes of Pure and Selfless thrown in for good measure and the end result is absolutely devastating. Combine this with today’s modern production techniques and this album easily surpasses any and all expectations. This is Godflesh – relentless, unforgiving, and amazing.